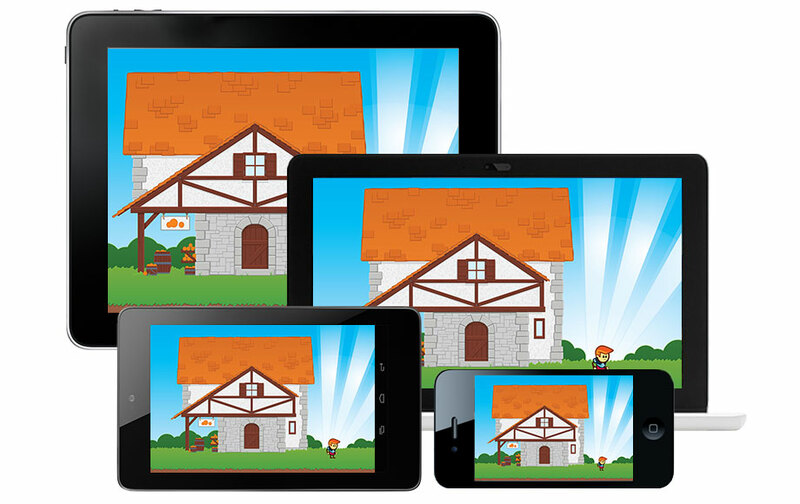 HTML5 games have the advantage of portability across many different devices. This poses a challenge of how to fit the game on the various different aspect ratios of tablets, phones and desktop browsers. This article will describe scaling techniques, including the use of a game safe area, to best fit an HTML5 game regardless of where it is played. We can use CSS to simply stretch the game to the size of the viewport. As you can see in the following example this approach can cause the game to be stretched when the viewport and game aspect ratios are different. We can remove the stretching by changing the CSS height from 100% to auto. Each time the viewport's dimensions change the resizeGame function will determine it's new size using the window's innerWidth and innerHeight properties. If the game is inside an element that doesn't fill the entire viewport (like the examples in the article) we could alternatively use that element's offsetWidth and offsetHeight properties. In this new example the game is no longer stretched. It will respect the game aspect ratio regardless of size of the viewport. This approach however can cause unwanted cropping at certain aspect ratios. 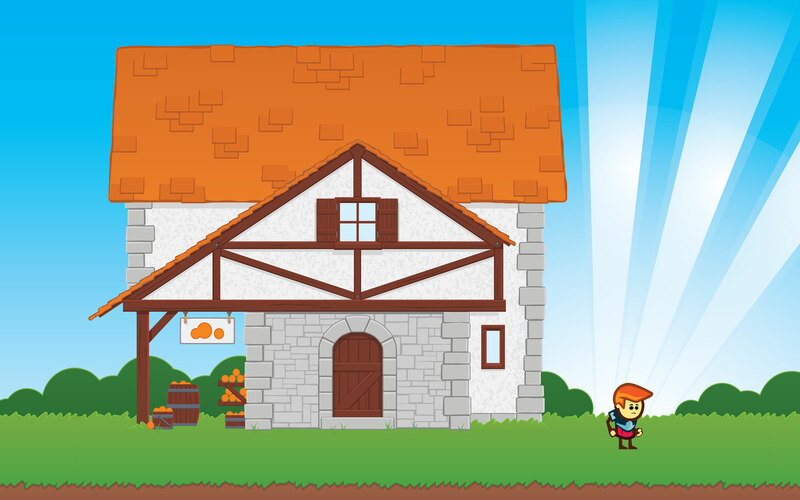 In our example game we have can no longer see the bottom of our house and our game character. If we want the game to fit inside the viewport without stretching we will need to scale it differently depending on the game and viewport's aspect ratios. If the aspect ratio of the game is larger viewport's aspect ratio then we size the game so the heights are the same. In other words, in the case of our landscape game, if the game's aspect ratio is taller than the viewport's then we can fit the game inside the viewport via the height. If it's wider then we need to scale via the width instead. This will result in a game that always fits inside our viewport without the cropping and stretching from the previous approaches. Let's balance it a bit more by centering the game with a little letterboxing. We make the mattes on each side of the game by setting the padding of the game element by half of the difference in game and viewport size. Give it a try in the demo by changing your browser size or rotating your mobile device. The above approach will allow our game to fit on any size viewport. On devices with dimensions different from the game we will get letterboxing. Although unavoidable at extreme viewport aspect ratios we can minimize the mattes by implementing a game safe area. This will allow us to crop portions of the game that are not integral to gameplay thus allowing the game to fit across devices. Carefully choosing the game and game safe aspect ratios will allow us to fill the screen with no mattes on all modern mobile devices in our chosen orientation. Next we need to once again update the part of the code where we determine the new game dimensions. This time we need to handle four scenarios which we will be calling: A, B, C and D.
The first two scenarios A and B handle when the game aspect ratio is taller than the viewport aspect ratio. A also has the requirement that the aspect ratio of safe height to game width is taller than the viewport. 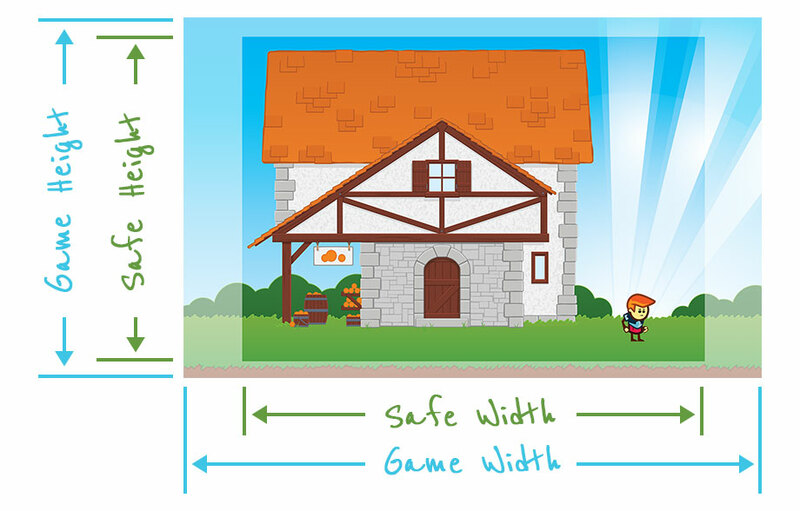 B has the requirement that the aspect ratio of safe height to game width is also shorter than the viewport. The last two scenarios C and D handle when the game aspect ratio is wider than the viewport aspect ratio. C also has the requirement that the aspect ratio of safe width to game height is wider than the viewport. D has the requirement that the aspect ratio of safe width to game height is also less wide than the viewport. And finally here is our example game with a game safe area implemented. Here is the code to scale our example game with a game safe area. The full source code and assets can be downloaded from GitHub.